Malcolm Moncheur spent part of his Thanksgiving break dropping into a 217-foot cave in West Virginia. The ESF senior, a bioprocess engineering major, seized the opportunity for adventure through the Syracuse University Outing Club (SUOC), and he believes it ranks as one of the top trips he has ever been on. Despite the group's name, at least half the SUOC members are usually ESF students, said Moncheur, who is club vice president. "I get to meet a lot of SU students who I wouldn't have the chance to meet otherwise, like my current off-campus roommate," Moncheur said. His roommate is the club president. Excursions are the heart of SUOC. Activities range from all-day hiking trips to white-water kayaking and ice climbing. SUOC members also mountain bike, canoe and rock climb. Many of these activities are demanding and bring members closer together, said ESF sophomore Leah Hill, an environmental studies major. "You stay in tight quarters for a lot of these trips," Hill said. "Like when hiking through a cave and having somebody's bum in your face for a number of hours - it really breaks down barriers." Hill said that during the annual spring break trip to West Virginia, an unexpected snowstorm blew into the area where she was staying with a large group of club members. The cabins were not heated and few people had properly prepared for the snow, so it was a memorable bonding experience. "It's sort of like coming back from a war and trying to talk to an outside person," Hill said. "We do a lot of hard-core things and often people don't understand all of the emotion that goes into it." For some families, SUOC is a tradition. Relationships sometimes begin through the club, continuing into marriages that produce children who attend SU or ESF and join SUOC. Hill knows several "SUOC babies" who joined the club partly because both their parents were involved as students. Hill joined SUOC as a sophomore and plans to stay in the club throughout her time at ESF, working up to becoming a leader in an outdoor activity. Each trip needs a leader - someone experienced in an activity - to offer guidance to those who are new to the excursion. To become a leader, members must officially "shadow" a current leader twice in the activity. Hill said she has already met the requirements to be a leader for horizontal caving, which involves hiking through caves that are flat and don't require dropping or climbing vertically. However, she would like to become a leader in multiple activities, including backpacking and rock climbing. ESF freshman John Orgera, an environmental biology major, also hopes to become a leader in several excursions, including backpacking. He has also considered trying to become a member of the Patch Council, the legislative board of SUOC's leadership. Outings in the forest can be an opportunity to put into practice what he has learned in class. Orgera recalls being out in the woods on trips and identifying species of mushrooms that he'd learned about in class. SUOC members don't always just get outdoors for fun; they also find ways to volunteer. 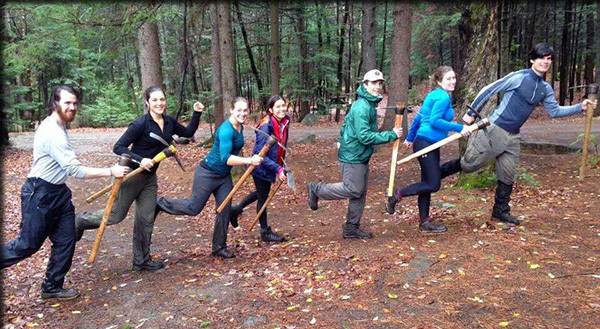 Orgera said that about two weeks before Halloween, he did some trail maintenance at Avalanche Pass in the Adirondacks. He came back at the end of the semester to climb some peaks in the area and saw much of the work he'd done to repair the trail was still intact. "Between the hike and the maintenance trip there was a lot of change; there was snow on top of the mountains and the trees had all lost their leaves," Orgera said. "But I saw the work we'd done was still there, and I felt proud." SUOC is open to both undergraduate and graduate students at SU and ESF. Joining involves creating a profile on the club website and paying dues. Members report to the equipment room, known as the "e-room," in the Skybarn at South Campus, Wednesday and Thursday evenings to get the proper equipment for and information about trips in which they plan to participate. Meetings are 7:30 p.m. Tuesdays in the Heroy Geology Building auditorium on the SU campus.